Is Trump Threatening to “End” North Korea? The US under Trump believes that more sabre rattling will cow DPRK down and make them surrender. The nuclear stand-off between Democratic Peoples Republic of Korea (DPRK) and the US continues, with the US sending its aircraft carrier strike force Carl Vinson and USS Michigan, an Ohio class nuclear submarine, off the Korean peninsula. Trump has held out the threat that if China does not intervene, the US will “solve the problem” of a nuclear DPRK “by itself”. The Korean peninsula and nearby countries including Japan, are now in imminent danger of another US military misadventure that can spin rapidly out of control, leading even to a nuclear exchange. While the world now admits that the Bush administration lied about the Iraq WMD's, no serious questioning has ever been done on Bush's claims that DPRK violated the 1994 Agreement. DPRK is held responsible for breaking of the 1994 Agreed Framework though it is the US that walked out of it. If we read the mainstream western media, DPRK leaders are “unstable”, “volatile”, “irrational” and the root of the problem of a nuclear DPRK today. Neither has any serious consideration been paid to why DPRK has built a nuclear deterrence, dismissing its need for security as irrational. The world has forgotten that the US brutally bombed and napalmed DPRK during the 1950-53 Korean War, leading to the loss of 20% to 30% of its population. During the McArthur Congressional hearings, Gen. O'Donnell testified, “...I would say that the entire, almost the entire Korean Peninsula is just a terrible mess. Everything is destroyed. There is nothing standing worthy of the name...” (Vol. 4, p. 3075). While the world might have forgotten this carnage, for the Korean people, this memory remains still fresh. The US has also never forgiven the DPRK and the Peoples Republic of China for the defeat that they inflicted on the US in Korea. At periodic intervals, the US ratchets up war hysteria over DPRK and conducts aggressive war games near its borders in the demilitarised zone around the 38th parallel. In violation of the 1953 Armistice, it introduced nuclear weapons in 1957 in Korea. The US also maintains a nuclear arsenal with sea and submarine forces, and has held nuclear weapons in Okinawa under secret agreements with Japan, though Japan has a constitutional bar against nuclear weapons on its soil. There are currently around 50,000 U.S. troops stationed in 23 military bases in Japan, and around 28,000 in 15 military bases in South Korea. DPRK also looked at what has happened in the world after the fall of Soviet Union. The US and NATO forces bombed and invaded Serbia, Iraq and Libya. Would it have done so if they had nuclear weapons? The DPRK started a nuclear and a missile program in the 1980's, and by early 1990's, was in position to create fissile material from its 5-MW reactor in Yongbyon. It felt that a nuclear capability would provide a bargaining counter with the US for longterm peace in the peninsula, and avoid costly conventional military build-up that it might otherwise need. In early 90's, the US intelligence agencies claimed that DPRK had a stock of plutonium from the Yongbyon reactor and its plutonium reprocessing plant. Estimates varied from a few grams to a few kgs of fissile grade plutonium, sufficient for one or two bombs. DPRK had also started plans for two Light Water Reactors of 50-MW and 200-MW capacity for producing electricity. This were to be commissioned by early 2000. Once all these facilities were in place, DPRK would have had the capability of producing up to 20-25 bombs a year, and therefore a credible nuclear arsenal. Simultaneously, it was also developing missile capability, by upgrading the Soviet era missiles in its stock, and creating the next generation of missiles. The 1994 Framework Agreement was negotiated between the US and DPRK in this context. Its key features was dismantling the existing Yongbyon reactor, stopping the construction and eventual dismantling of the 50-MW and 200-MW reactors, and put all its spent fuel from which fissile plutonium could be extracted under IAEA safeguards. In lieu of this, the US agreed to provide two 1000-MW Light Water Reactors and supply fuel oil for producing electricity till these two reactors were built. What the mainstream media neglects to mention is that the US never held up its side of the bargain. By 2002, instead of the two 1,000 MW reactors being finished as agreed, only some civil works had started. The fuel oil shipments, supposed to continue as long as the reactors were being built, saw only sporadic supplies. The Bush administration, when it come to office in 2002, had identified DPRK as a part of the axis of evil, along with Iraq and Libya, and wanted to blow up the 1994 Agreement. The AQ Khan link to DPRK and its importing centrifuges from Pakistan for a uranium enrichment program was the excuse. As John Bolton, the US Ambassador to the UN puts it, “It was the hammer I had been looking for to shatter the Agreed Framework.” The US walked out of its commitment of the 1994 Agreement, laid down conditions that DPRK had to “surrender your nuclear and missile program or else.” DPRK chose “or else”. Did DPRK conduct a clandestine uranium enrichment program forbidden under the 1994 Agreement? While the US argued that any uranium enrichment program was against the “spirit” of the agreement, they never addressed the question under what clause was producing Low Enriched Uranium (LEU) fuel barred in the 1994 Agreement. Did DPRK have a legitimate reason to start a uranium enrichment program? Much of the discussions that apply to DPRK is also common to the Iran issue. The Nuclear Non Proliferation Treaty (NPT) allows for peaceful use of nuclear energy including a fuel cycle. If DPRK did not want to be dependent on the US for nuclear fuel, it would need an indigenous fuel program. Therefore, uranium enrichment for fuel was a legitimate need of its civilian nuclear energy program. Of course, the same centrifuges can also produce Highly Enriched Uranium (HEU) required for a weapons program. That is why it is a dual use technology. The US had the option of accepting, as it has now done for Iran, that DPRK has the right to a nuclear fuel cycle. It had also the option to negotiate capping of DPRK's missile program, give guarantees against aggression, and stop the highly provocative military exercises it carries out each year. Instead, it walked out of a functioning Framework Agreement, which had effectively dismantled DPRK's plutonium program. DPRK then walked out of NPT, took back the 8,000 kg spent fuel roads it had handed over to IAEA, and within a few years conducted nuclear tests. Its missiles can now reach Japan and the US military bases in Okinawa and Guam, and in another 3-4 years, even reach the US mainland. 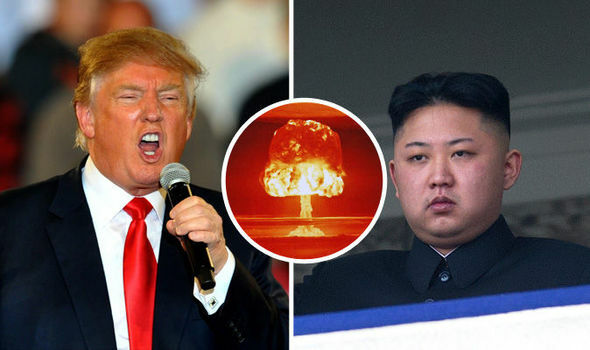 The US under Trump believes that more sabre rattling – this time with aircraft carriers and nuclear submarines – will cow DPRK down and make them surrender. The US and Bush Junior's policy of browbeating DPRK did not work in 2002. Why would the US and Trump's threats be more credible today after DPRK has built a nuclear arsenal? Or does Trump believe what Bolton wrote recently: the only way to end North Korea's nuclear program is to “end North Korea”. Something that Senator Lindsay Graham is also advocating. Take out North Korea in a preemptive strike even if it means “sacrificing” South Korea and Japan, and damage to China. Do China, South Korea and Japan have an opinion regarding such a suggestion? Is this what Trump is contemplating when he says that the US “will solve the problem by itself”?